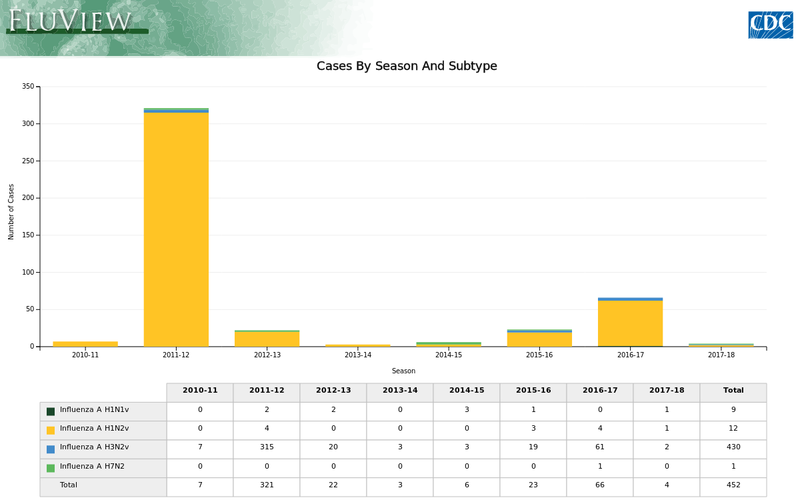 Although we've only seen one reported human infection with a swine variant virus this summer (see June 30th's Indiana Reports H3N2v Infection In Fairgoer), this is the time of year when we generally start seeing more cases. Some years, only one or two are identified. Other year's - such as we saw in both 2017 and 2012 - dozens or even scores have been reported (see chart below). Most (but not all) swine variant infections are mild or moderate, and are clinically indistinguishable from regular seasonal influenza. Which is why it is believed many swine variant infections go undetected (see CID Journal: Estimates Of Human Infection From H3N2v (Jul 2011-Apr 2012). Yesterday the Livingston County (Michigan) Health Department (LCHD) announced the detection of swine flu among pigs at the Fowlerville Family Fair - which ran from July 23rd-July 28th. So far, I've not found any indication of the swine flu subtype. 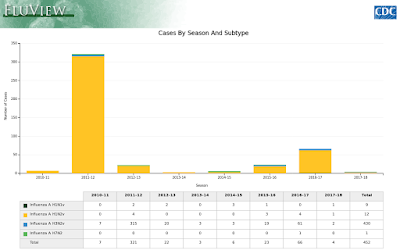 While outliers are very occasionally reported (see USDA IAV-S Surveillance Program Detects Novel H3N1 In US Swine) North American pigs normally carry H1N1, H1N2, or H3N2 swine viruses. More than 90% of all human swine variant infections have been with H3N2v (see J. Virology: Pathogenesis & Transmission of H3N2v Viruses Isolated in the United States, 2011-2016). While no human infections have been reported from Livingston County, local public health officials are asking swine exhibitors, their families, and anyone who visited the swine barn to notify them of possible exposure to infected pigs. The LCHD is also asking local healthcare providers to be alert for any cases presenting with respiratory symptoms who had recent exposure to swine or who visited the fair. HOWELL, Michigan. – (July 27, 2018) The Michigan Department of Agriculture and Rural Development (MDARD) identified pigs at the Fowlerville Family Fair that tested positive for swine flu (influenza A). The Fowlerville Fair Board has taken steps to isolate infected pigs to prevent additional exposure. Infected pigs began showing symptoms in the evening of Thursday, July 26 and laboratory results were confirmed late Friday afternoon. The fair is scheduled from July 23-July 28. At this time, there are no reported human illnesses. The Livingston County Health Department (LCHD), in coordination with the Fowlerville Fair Board, are reaching out to swine exhibitors, their families, and those attendees who visited the swine barn at the Fowlerville Family Fair to notify them of possible exposure to infected pigs. The LCHD is also instructing healthcare providers in the area to watch for patients presenting with respiratory symptoms who report exposure to swine or who visited the fair. Swine flu can spread quickly between pigs and while rare, can pass to humans through droplets in the air when sick pigs cough or sneeze. Human symptoms of swine flu are similar to those of seasonal flu and can include fever, cough, runny nose, and sometimes body aches, nausea, vomiting, or diarrhea. Symptoms usually appear within three days of exposure but can occur up to 10 days. Sometimes swine flu causes severe disease even in healthy people, such as pneumonia which may require hospitalization, and sometimes death. People who are at high risk of developing complications if they get swine flu include children younger than five years of age, people 65 years of age and older, pregnant women, and people with certain chronic health disease, such as asthma, diabetes, heart disease, weakened immune systems, and neurological conditions. While the pigs at this fair were symptomatic - thus sparking the alert - pigs can often carry swine influenza with little or no signs of illness. Last August's EID Journal: Transmission Of Swine H3N2 To Humans At Agricultural Exhibits - Michigan & Ohio 2016 examined the risks of novel flu transmission at these types of venues, including from healthy-looking pigs. Despite the current low risk of infection, there are some things you should consider doing to reduce your chances of getting sick, particularly if you are at `high risk' of flu complications. This from the CDC. 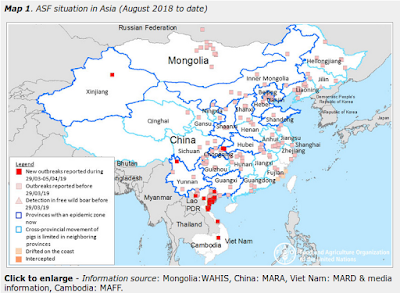 While not expected to be as severe as some of the other novel viruses we are watching, immunity to these swine variant viruses is likely very low, and so the CDC's IRAT Influenza Risk Assessment Tool lists H3N2v as having moderate pandemic potential. Swine flu viruses aren't just a North American concern, as they circulate all over the world. Surveillance in many places, however, is either close to nonexistent or marginal at best. How many human infections occur, and how many different variants there are in circulation, is unknown.